We are living in an upside-down world. Our wild, strong bodies are sedentary. Intimacy is down, and passivity and isolation are up. Our weak, needy hearts are lonely. We are anxious, tired, overwhelmed, and addicted to technologies we don’t fully understand, yet our culture has little to say about something we all feel” (p. 9). Technology advances at a frantic pace, and our smartphones consume our time, attention, and real time. Like most of us, Christina Crook has a love-hate relationship with the Internet. She battles the temptation to check her Facebook page umpteen times a day even when deadlines loom and children call. In The Joy of Missing Out, she writes about her decision to fast from all online activities for thirty-one days. Crook poses several basic questions: What does our communication look like today? Why should we do something about the pervasiveness of the Internet in our lives? And how can we take steps to achieve more balance technologically? True, this is not a new topic. But her personal stories and examples substantiate the data she presents. Her writing is compelling. And the fact is, the Internet is here to stay. Too often I see my time, attention, and focus lured away from what matters most to me by the Internet. This book made a strong impression. I appreciate Crook’s candor and balanced approach. “Chapter challenges” provide room to write answers to thought-provoking questions at the end of each chapter. The final chapter contains a six-week guide to gaining more control over our online behavior. I am eager to apply these suggestions in my journey from FOMO—fear of missing out—to JOMO, as referenced in the book’s title. 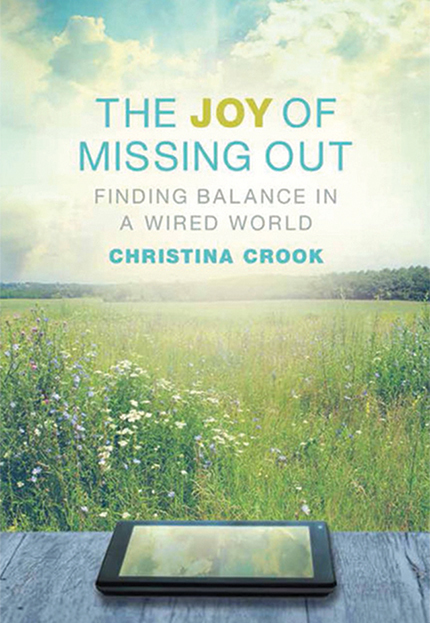 The Joy of Missing Out would be a timely read for small groups, book clubs, and parents. Anyone concerned about Internet use, time management, and being more present would benefit from this book.